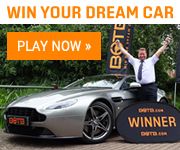 Win A Car With The BOTB Competition. BOTB (Best of the Best Plc) was established in 1999 and has been located in major airports, shopping centres and online at www.botb.com. Every week someone is guaranteed to win their Dream Car. In the past 19 years, there have been over 400 winners, taking home over £23 million worth of prizes. You can win a dream car for just £1 see website for details.